One week from today, Michael J Fox returns to TV as Mike Henry, a popular NYC news anchor who retired early due to his Parkinson’s diagnosis… but now his family wants him to return to work, they’re really sick of him serving kale in every meal. I’m looking forward to Michael returning to TV, especially that he wont be hiding his PD. The show isn’t about Parkinson’s, but the dynamics of his character’s family and how they’re affected by the disease. I hope that it’ll bring new awareness of the disease to every home, and get rid of a lot of bad misconceptions. Oh and more funding for the cure!!! So to celebrate Michael’s return — I thought it would be fun to throw together a dish that had elements of the show and the MJF Foundation. 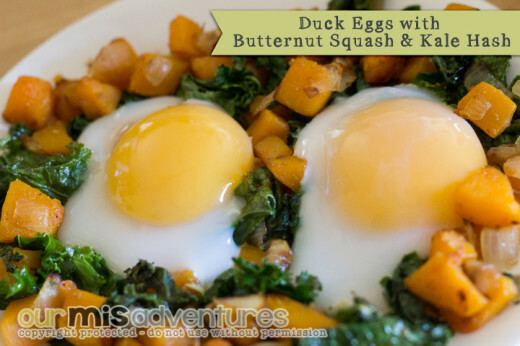 Enter my Duck Eggs with Butternut Squash & Kale Hash — kale for Mike Henry’s obsession with the food, and butternut squash for the bright orange that’s the signature color of the MJF Foundation. The duck eggs represent brain health, as they’re high in Omega 3’s & other important nutrients. It’s completely primal — I love it! This is my first time cooking with duck eggs — I picked them up at the Farmer’s Market on Wednesday because they were a great price, and Jeff had told me about a month ago that he really wanted to try some. We were both surprised to learn that the “whites” aren’t opaque once completely cooked — their semi-transparent state actually caused us to cook them to medium (instead of easy) before we realized that the whites were cooked. Also, I’m a total newbie to kale. I made kale chips as soon as I got home from the market, but the thought didn’t occur to me that cooking kale in the oven — even when mixed with something else — would still cause it to crisp up. 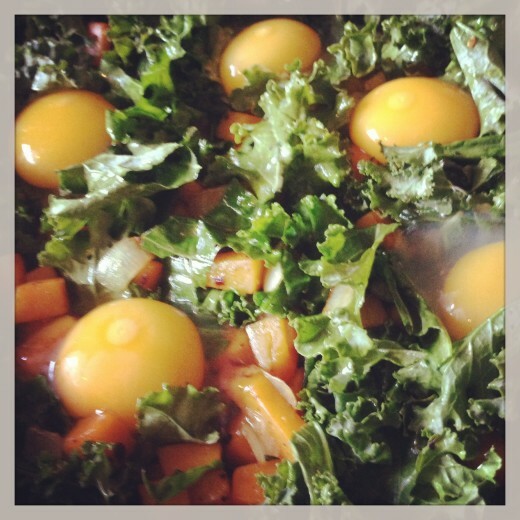 So originally I had cooked the squash and onion, tossed the kale in, added the eggs and popped it into the oven — which caused crispy kale. My thought process was that kale would wilt in the oven like any other green, but uh… it didn’t, duh. The second time around I cooked the kale in the pan until it was wilty, and it turned out perfectly! This dish is perfect for any mealtime this fall — and I really urge you to find duck eggs instead of settling for chicken eggs! The duck eggs have a flavor that plays so well with the squash and kale, it’s wonderful! Not only did I have it for dinner last night, but I had it again for a super late breakfast… ahem… lunch today. In an oven safe skillet or pan, sauté the first five ingredients until the squash is tender for your liking, about 15 minutes. Toss in kale and cook until wilted. Create little wells in the hash for the five duck eggs. Carefully crack the duck eggs so that the yolk doesn't break (duck egg shells are harder than chicken eggs) and place the eggs in their wells. Place pan in the preheated oven and cook until the bottoms of the eggs are set. Turn off the oven & turn on the broiler to high, and cook the eggs to your liking -- over easy is best for flavor. Make sure you don't over cook the eggs, because the whites on duck eggs are more translucent than chicken eggs. If you do not have an oven safe pan, you can fry the eggs in another pan or make soft boiled eggs to serve over the hash. Our pepper grinder also has red pepper flakes in it -- which really stood out well in this dish! All Copyrights Reserved by OurMisadventures.com unless noted otherwise. All before 7:30 this morning I had the dishes unloaded and loaded, a weeks worth of turkey breakfast sausage baking in the oven (hopefully a weeks worth, everyone is addicted to it,) and dinner (paleo chili) going in the slow cooker. This is all with me waking up sick with a cold this morning. I should wake up sick more often — I get things done! The turkey breakfast sausage is super easy to make, I’m only disappointed that I didn’t start making it the moment I discovered Penzey’s and memorized their catalog. It took the trip to Stanford for me to finally get my hands on their breakfast sausage seasoning, I was a week and a half into primal eating. I had just read through Elana’s new paleo cookbook , liked the sound of her turkey breakfast sausage… but didn’t want all the work of gathering the seasonings. With Penzey’s Breakfast Sausage Seasoning blend, it’s as easy as measure (1lb meat = 1+tbs seasoning,) mix, form patties, and bake. I form a large golfball sized portion then smash it to make the patties. With lightly greased glass baking dishes, I bake the patties at 400* for 25 minutes. It’s ridiculously easy. 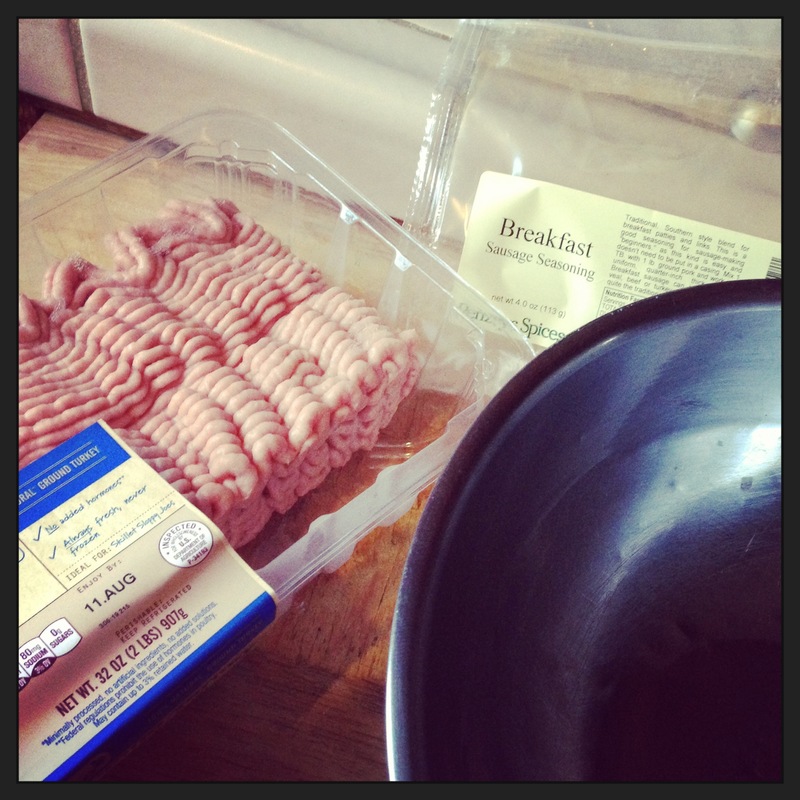 No nasty additives like store-bought sausage. Sorry, no nice picture of the end result… they’re hiding in the fridge and freezer so I wont be tempted to eat more. Everyone who has tried theses sausages has loved them, my in-laws even placed an order for me to make them some. Seriously — I’m going to have to buy the 1lb bag of seasoning next time. It’s so nice to have a working oven again! The oven in our house has never worked right, but in the last year or so it became useless. The issue was always temperature regulation — it was all over the place. After extensive googling, I figured out it was probably the thermostat — and that I could actually replace it myself for about $30. I figured that out like six months ago, and just now got around to doing it when we had the dishwasher replaced last week. The temperature is still off by about 30 degrees, but I can calibrate the oven another 35 degrees. But now that we have an oven that doesn’t make us want to take a sledgehammer to it, we’re starting to bake some primal friendly things! I say primal because most people who says paleo are strict about no dairy, and well… I’m a Tillamook kid at heart, I can’t give up cheese. Sunday night Jeff watched one of the Good Eats episodes on cheese, and decided I would have to make him some Parmesan Crisps soon. So last night, while exploring a local organic market in hopes that they might have some Paleo People granola (they didn’t… can’t wait until they start making it again!!) we picked up a wedge and gave it a go! We tried smoked paprika – as recommended by Alton Brown – but we didn’t care for it. But we LOVED Sunny Spain on the crisps! It’s basically a salt free Lemon Pepper seasoning. I’m so glad the sales guy at Penzey’s convinced me to get a small jar in addition to Jeff’s 8oz of regular Lemon Pepper seasoning LOL! Then this morning, I decided to try the Herb Crackers from Elana’s The Gluten-Free Almond Flour Cookbook , but with coconut oil instead of grape seed oil because of my random allergy to grapes. My father in law helped me taste test, he’s my partner in crime when it comes to grain free baking, and he thinks they taste like cheese its! I think they taste just like toasted almonds, which is pretty much what they are. Regardless, we both loved them. Next time I’ll add more rosemary and use a little less coconut oil. Since the parm and almonds are so rich, I don’t have to worry about making sure I eat these treats in moderation. This weekend is our bulk shopping trip to Costco, I think we’re going to have to get a big wedge of parmesan for more crisps and a block of sharp cheddar to make Elana’s Cheese Crackers. Now if the extreme heat would go away, I would use my oven even more! Going paleo has also forced us to stop eating out all the time, a terrible habit we had fallen back into this year. Our budget is thankful we’ve put an end to that! We spent about $200 at Costco about two weeks ago, and we still have a ton of meat left — I think we can easily draw it out to last us almost a month, thanks to our extra freezer. 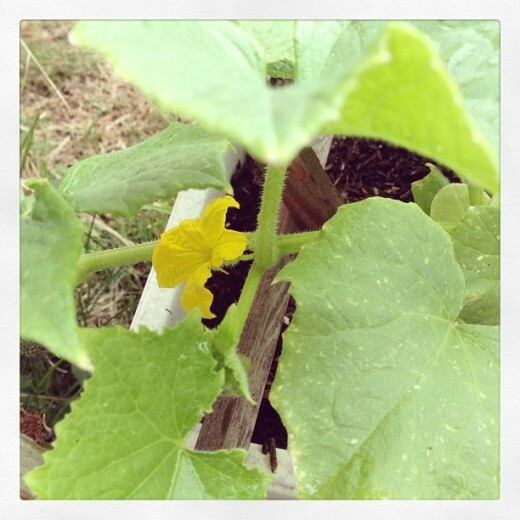 Now we just have to occasionally go to the store for veggies and some fruits, since our garden this year uhh… didn’t really make it. 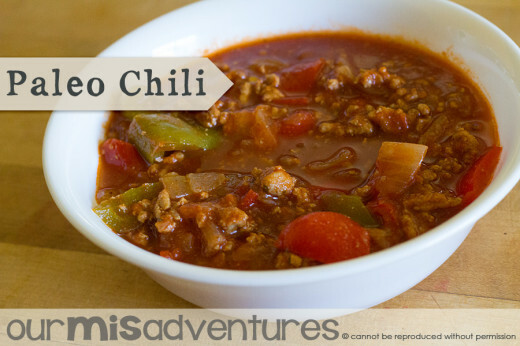 Our favorite paleo meal has to be this paleo chili recipe that I threw together based on what we had on hand. We’ve had it two more times now, and absolutely love it! It’s something that can easily be adapted for freezer cooking, I think on our next Costco trip — that’s exactly what I’ll have to do. This last time, I used Chili 9000 seasoning from Penzey’s. OMGAMAZING! Jeff definitely prefers a sweet chili, and this seasoning made that happen — plus it added a nice smokiness. Penzey’s has a few retail stores in California, but most people order online. Careful — Penzey’s is addicting. 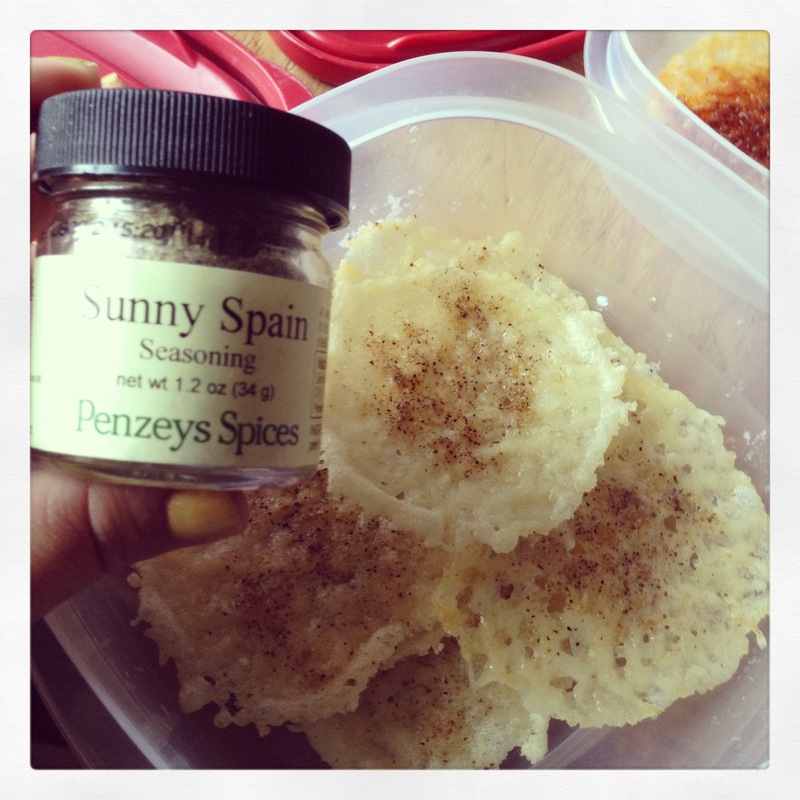 I have a picnic basket full of their spices now, and still have plenty more that I want to try next! Our favorites are their lemon pepper seasoning (yes, it’s better than any you can get at the market!,) breakfast sausage seasoning, and this! 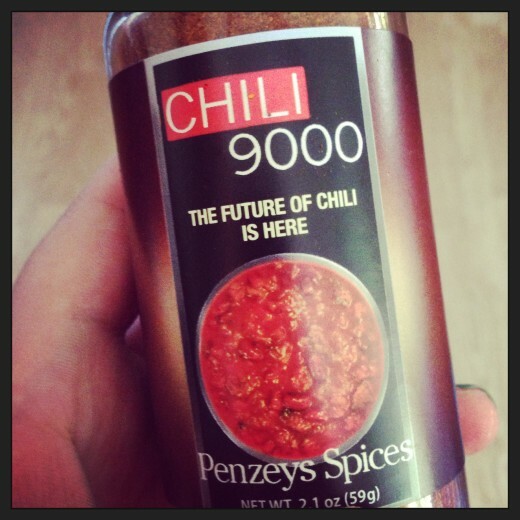 So, for our chili to be paleo that means — you have to make real chili. Every time I make this recipe, I can’t help but reminded of the episode of The Big Bang Theory where Sheldon gets jealous of Leonard’s girlfriend, later makes amends with her, and agrees to eat what she calls “chili” — but he can’t help but correct her that real chili doesn’t have beans in it. From what I understand, historically “chili” is a stew of meat and chili peppers — no beans. That’s basically what we do with this recipe. You can really use whatever peppers you like — we prefer bell peppers because the result reminds us of the stuffed bell peppers I grew up loving, sans rice of course. Also — we’ve been using organic canned tomatoes because our crop didn’t survive the worms and grass hoppers this year, but if you can get your hands on flavorful heirloom tomatoes — use those instead! With butter or coconut oil, sauté the onions and garlic in an enameled Dutch oven - never cook acidic things on straight cast iron. Once onions are glassy, add in meat, season with salt and some chili seasoning, then brown. Once meat is cooked, toss in the peppers & tomatoes, add in some more chili powder to taste. Cover and let simmer until peppers are softened to your liking. Stir occasionally. This recipe can easily be adapted to be done in a large slow cooker. Just dump everything into your slow cooker and cook all day! Perfect for freezer cooking if you use a slow cooker. Just be sure to never use frozen meat in your slow cooker -- it will not cook throughly -- so thaw completely first. Last time I made this (what's actually pictured) Jeff accidentally got tomato sauce instead of diced tomatoes. Really, whatever tomatoes you like -- whole, diced, etc -- will work great in this. The seasonal farmer’s markets have started back up, which means I’m driving Jeff only slightly insane. You see, when I’m under a ton of stress — any kind of stress — I tend to turn to canning things or baking. 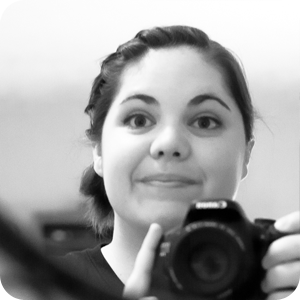 This week brought some family emergencies (things are better now) and a heavy work load. A work load I haven’t had in… forever it seems like! 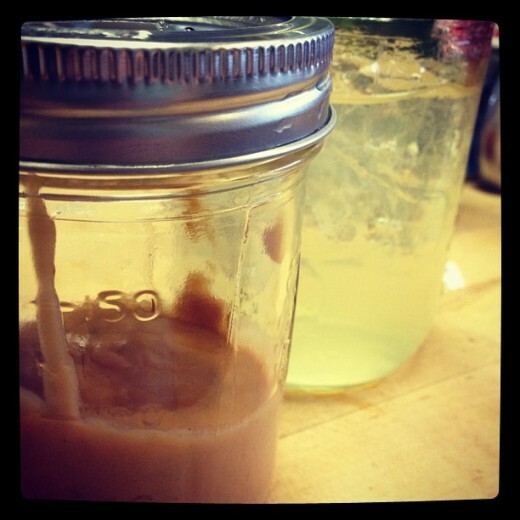 Mustard remanent jar in foreground, margarita in the background. But I somehow managed to put up a double batch of honey mustard and two and a half-ish batches of Vanilla Bean Apricot Jam. OH! And a batch of refrigerator pickles. Even after an exhausting Parkinson’s meeting day, I found myself coming up with an excuse to go to the Saturday farmer’s market… my friend Bekki needed groceries, so I picked her up and I just happened to buy another six pounds of apricots! I don’t know why, but canning things helps me unwind. I don’t like to sit still, especially after a day where I’ve been chained to my desk. Canning usually involves a variety of activities for each recipe, but it’s become such second nature my body just flows through the motions. Even though our AC is barely working at the moment — the guy comes on Monday — I still put up with the steamy kitchen to put up more goodies. My mom asked what I got myself with the amazon gift card she gave me for my birthday… she laughed when I told her I got more canning cookbooks just to have more recipes at hand. I definitely spent more than what the card was worth… but each and every book was worth it. 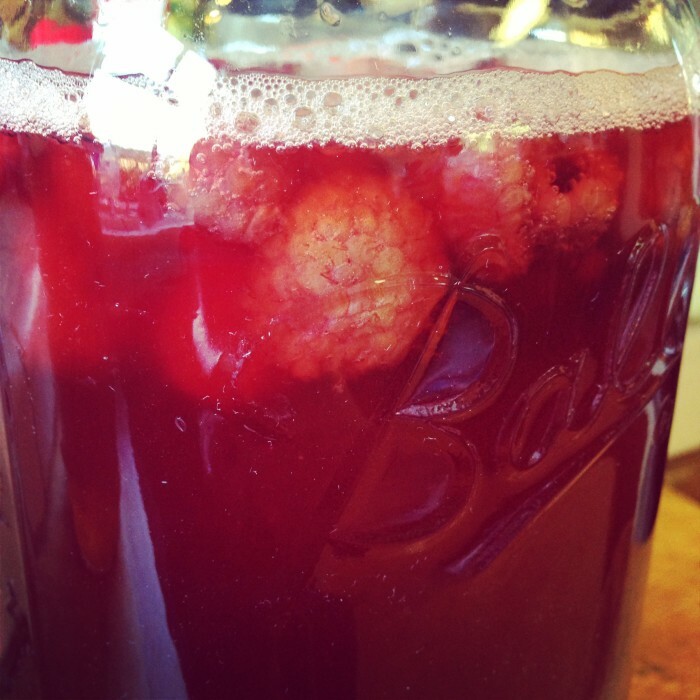 It’s interesting how many canning “philosophies” there are. And almost every book recommended Penzeys for spices… especially the pickling spice mix… I’ve already placed two orders and have a third list started. 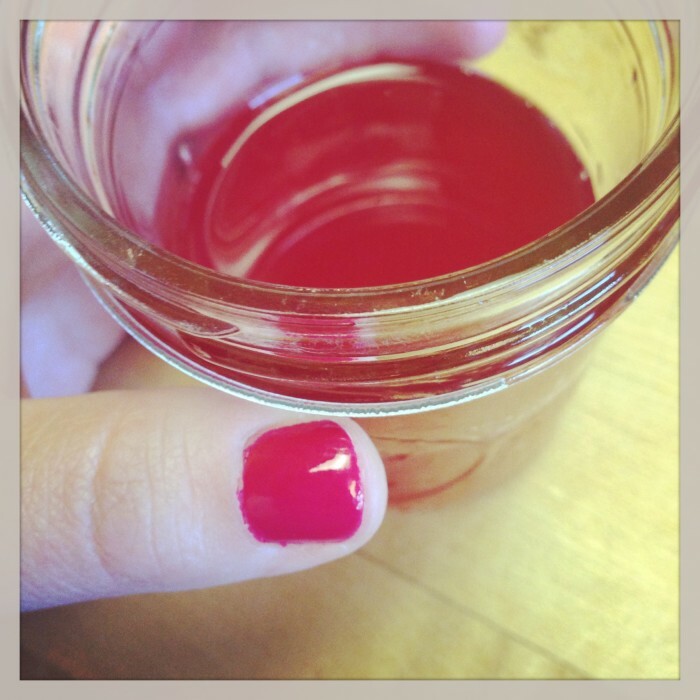 I can’t wait until my mustard seeds get here to make cherry mostarda — cherries hit the markets this week! Ooooohhh and Bourbon Brown Sugar Mustard??? YUM! 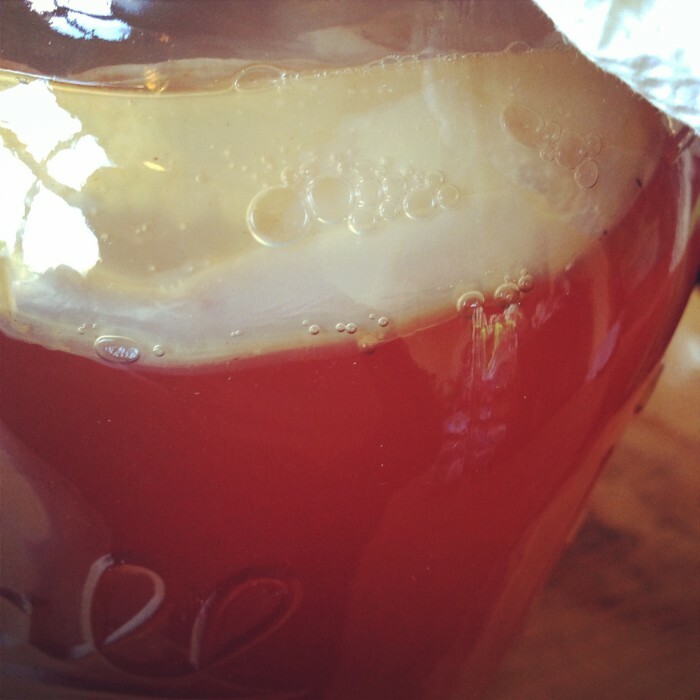 Even though canning helps me unwind after a stressful day, the best part is the reward at the end… the finished goodies. 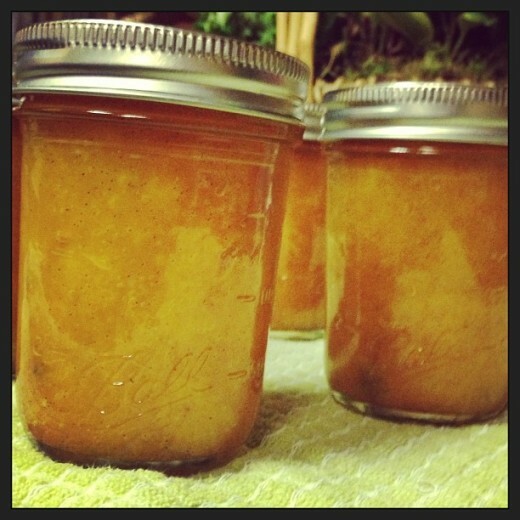 My last batch of the Vanilla Bean Apricot Jam… I made sure every little bit got into a jar! It’s literally pure gold — in color and value. 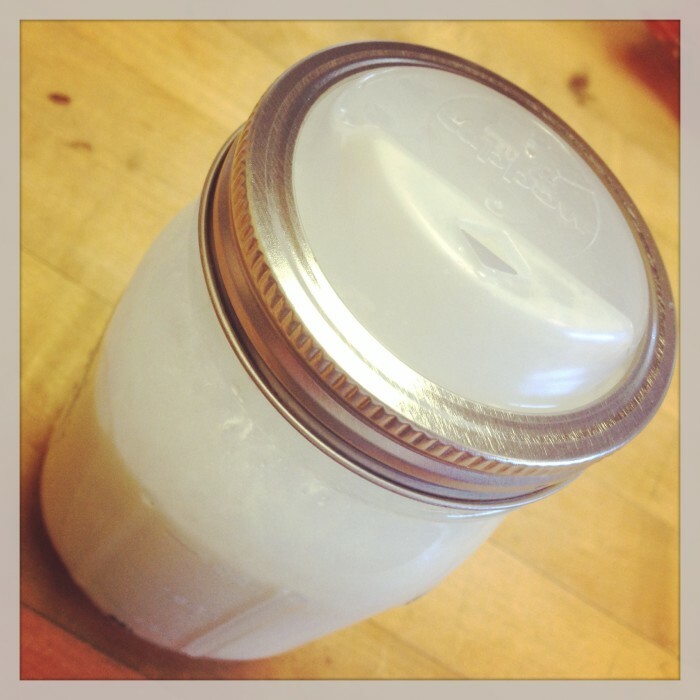 There are *some* people who have to be bribed with a jar in order to get me a favor! Lately, we’ve had a hankering for all things caramelized. Jeff finally has realized that crème brûlée is an amazing treat! The other morning, I had to get up before dawn to deal with a problem our chickens have had. 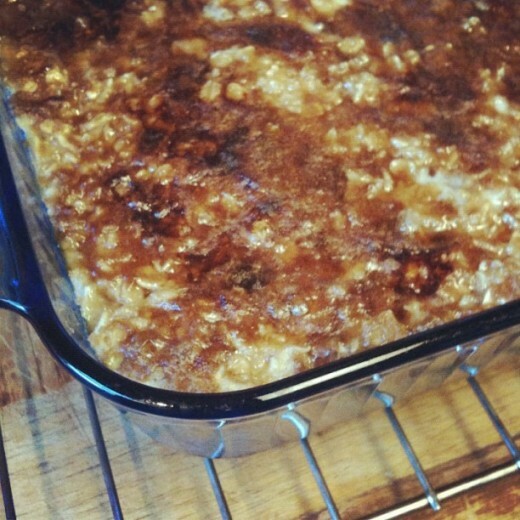 So, I decided to go ahead and use my extra time that morning to try a new recipe out – baked oatmeal! The night before, with a box of kleenex and mug of tea for my cold – I scoured the internet for recipes. I’ve seen the different variations posted on Budget Bytes, but I wanted something simple but pleasing. Finally, I came across this simple recipe and decided it was a good base for what I wanted to do! This technically isn’t a brûlée – the baked oatmeal does turn out somewhat custard like, add the caramelized brown sugar topping – and it’s brûlée to me! Serve it steaming hot with some cold milk poured over it – and it’s a wonderfully pleasing breakfast on a cold and early morning! Heat oven to 350 F. Prepare an 8x8 inch glass baking dish by spraying with a non-stick spray oil, like Pam. 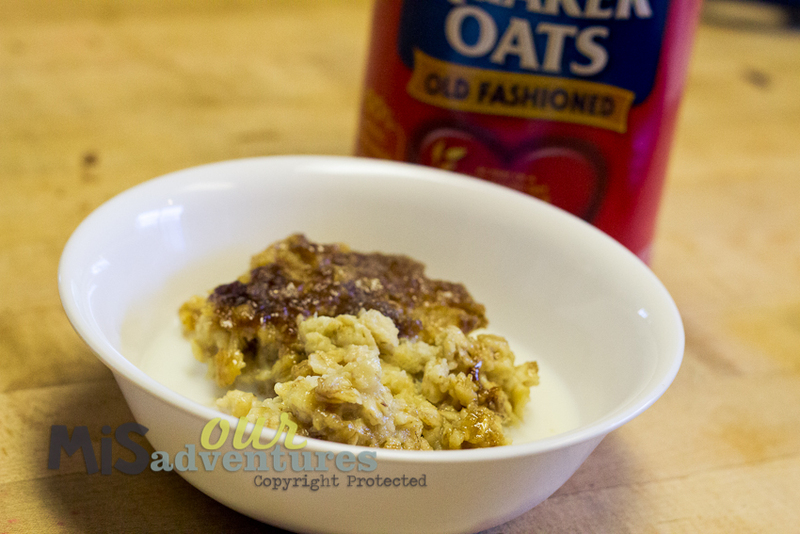 In a large mixing bowl, combine the oats, granulated sugar, and 1 tsp cinnamon. In a medium mixing bowl, lightly beat the two eggs and mix with vanilla and milk. Combine the two mixtures in the large mixing bowl and mix well. Pour into the baking dish and bake for 40 minutes or until the center is just slightly jiggly. Remove from the oven, but leave the oven on. Combine the remaining cinnamon with the brown sugar and spread evenly over the top of the oatmeal. Return to the oven and bake for another 2 to 3 minutes until the sugar melts. Set the oven to broil on high and move the oatmeal to the top of the oven, but no closer than three inches from the element. Broil until the sugar begins to bubble and brown - this will happen in a minute or two, so do not leave the oven!!! 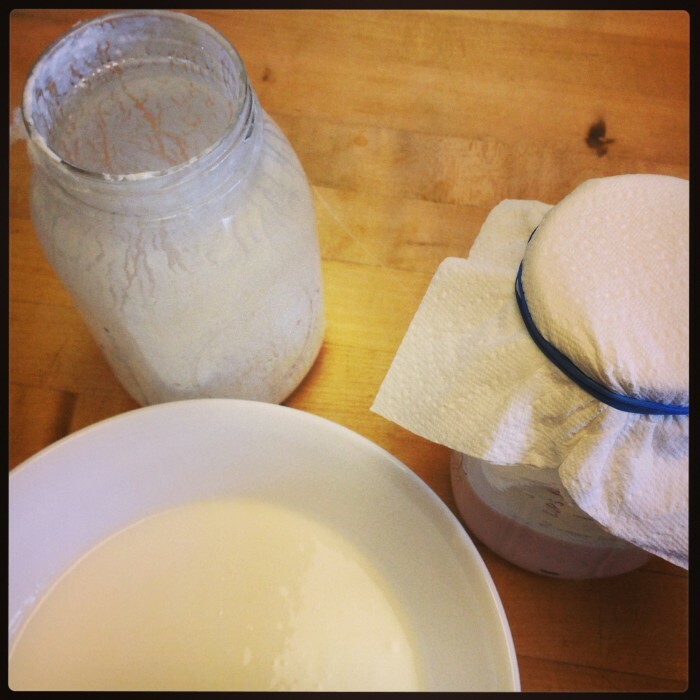 Serve in bowls with cold milk! 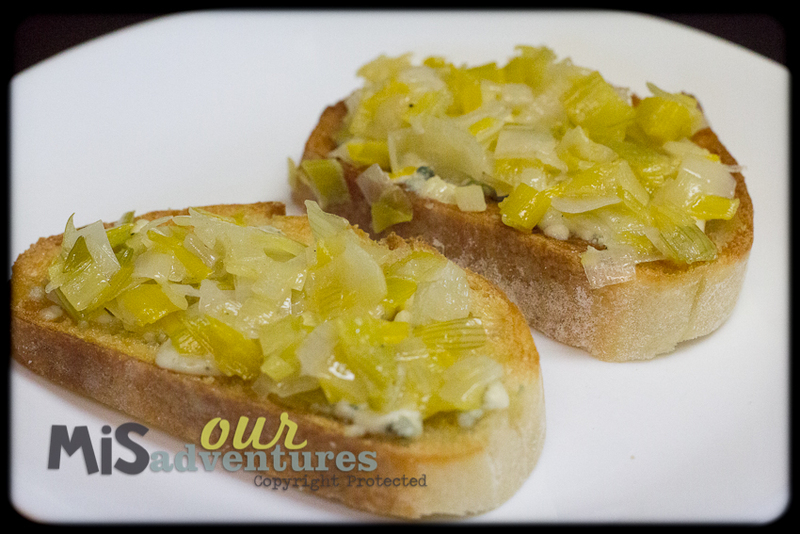 This evening I have a recipe for you that I couldn’t wait to share – Leek Bruschetta! This is the perfect recipe for you to try if you love bruschetta and haven’t tried leeks before. My husband loved it so much that he agreed it needs to become a permanent treat on our menu! I’ve loved all the goodies that have come in our weekly CSA boxes, one of the veggies we’ve been getting each week are leeks. I saved last week’s leek to use with this week’s leek for Potato Leek Soup. However, my friend Petra shared this Leek Bruschetta recipe with our recipe swap group, and I just had to try it! Fortunately Jeff will still get his favorite soup – I picked up about nine leeks on clearance at the grocery store today! It really is the perfect recipe to get your bruschetta fix when tomatoes are out of season! Cut the tops and bottoms off the leeks so that only the white and light green parts remain. Halve the leeks lengthwise, then run under water while separating the sections to rinse out any sand or dirt. Chop the leeks up finely and dump into the sauce pan and season to your liking. Reduce heat to low (on the higher side of low, a 2 to 3 on my stove) and cover. Let the leeks cook for 25 minute, stirring occasionally. While the leeks are cooking, cut the bread into slices about a 1/4 inch thick. 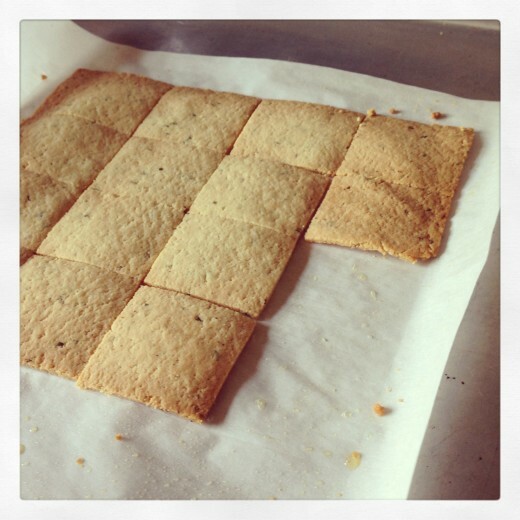 Arrange the slices on a baking sheet lined with parchment paper. Brush the top of the bread slices with olive oil. When about ten minutes remain to the leeks cooking time, toast the slices of bread under your broiler on high. Place the baking sheet in the middle of your oven so they don't burn quickly. After the bread is lightly toasted, remove it from the oven and top with cheese. If the cheese isn't melting, melt it a little under the broiler while the leeks are finishing up. Once the time is up for the leeks, spoon them over the slices. Toast a little more under the broiler if desired, and enjoy! There are several things in life that give me comfort, and one of them is a good granola. Up until this last week, I had never made my own. That all changed when we visited my grandparents and Jeff fell in love with my grandma’s granola. Jeff doesn’t eat things like granola, he’s a meat and potatoes kind of guy… breakfast to him is fried eggs or a bowl of sugary cereal. Of course I had to jump on this opportunity to get him eating better breakfasts! Fortunately my grandma included the granola recipe in a binder of family recipes she gave us for a wedding gift. Unfortunately I didn’t have any her granola while we were visiting, so I didn’t know exactly what all she put into it. After picking Jeff’s brain and a few phone calls to my grandma, I knew what I wanted to do. 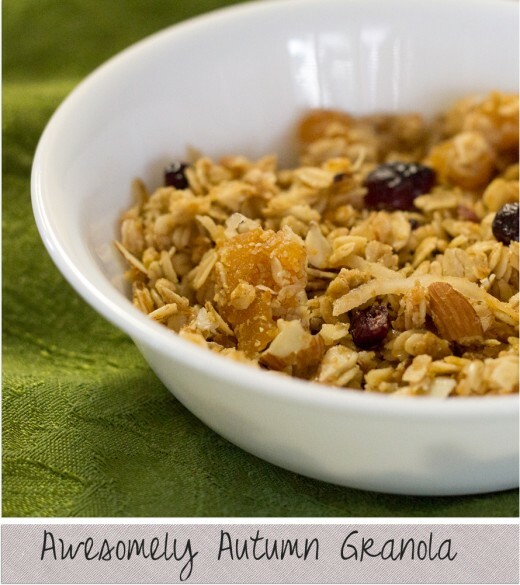 The result is a flavorful granola that reminds me of fall, both in its flavor and colors. The cinnamon definitely gives you a warm feeling of autumn. It’s been a hit with everyone who tries it, next time I need to make more! 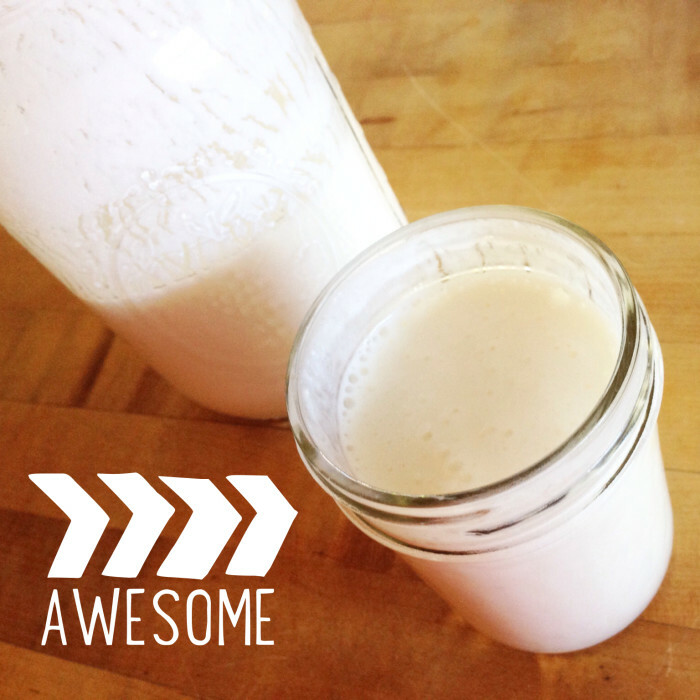 This recipe is completely customizable — you can use different mix ins! You can also make half a batch or a full batch. Initially I only made half, and that was a mistake. Four days later there’s only a serving or two left! Combine all the dry ingredients (except salt and cinnamon) in a large mixing bowl. 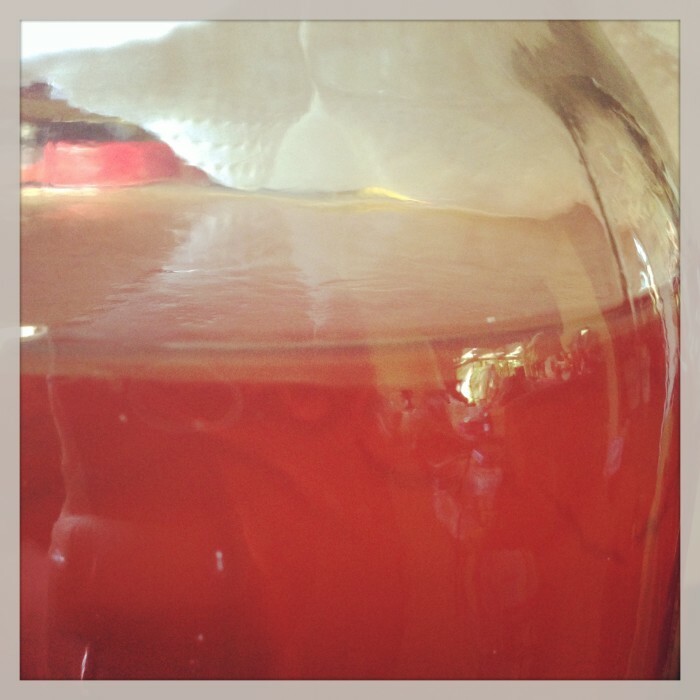 Heat the honey, oil, salt, vanilla, and cinnamon on the stove or in the microwave until well combined and warm. Pour wet ingredient mixture over the dry ingredients and mix well. Line two jelly roll pans with parchment paper and spread the mixture evenly on both pans. Bake at 250F for 25 minutes. If you want a crunchier granola, continue to bake but stir the mixture every 10 minutes. 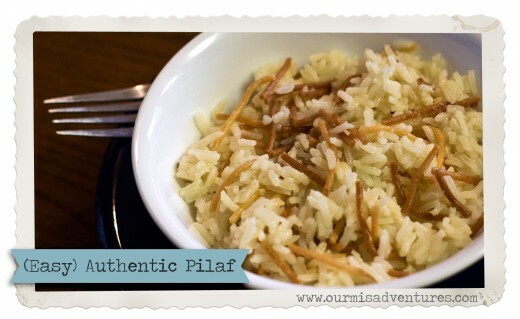 When I was growing up, one of my favorite side dishes was my grandma’s pilaf. It was simple, yet it had a ton of flavor! Over the years my love for pilaf hasn’t faltered, I still can’t go near the boxed pilaf mixes. Once you’ve learned one time-saving technique to making pilaf – you’ll never be able to go back to the boxed kind. All you have to do is brown a large batch of vermicelli to store for future batches of pilaf! Pilaf goes with almost any meal, and since we always have browned vermicelli on hand… pilaf is a common side dish year round in our house! Browning the vermicelli in large batches saves you a lot of time when it comes to prepping your meals. All you have to do is measure out the vermicelli once you have a stockpile of it! It turns making pilaf as easy as making plain rice. And with the rest of your holiday cooking and festivities, you need all the extra time you can get! In a large skillet, melt the 2 tbs of butter over medium heat. 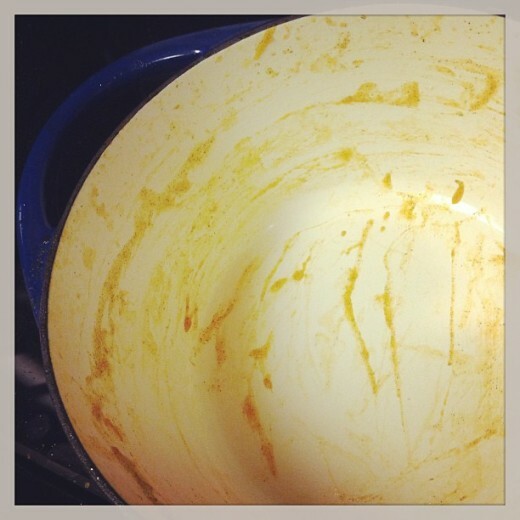 After butter has melted, add enough vermicelli pieces to cover the bottom of the pan. You can either brown the entire box of vermicelli to store for future batches of pilaf, or just the 1 cup portion needed to make one batch of pilaf. Brown the vermicelli in the butter, stirring regularly to brown the pieces evenly. They should reach a nice golden brown color, do not burn! 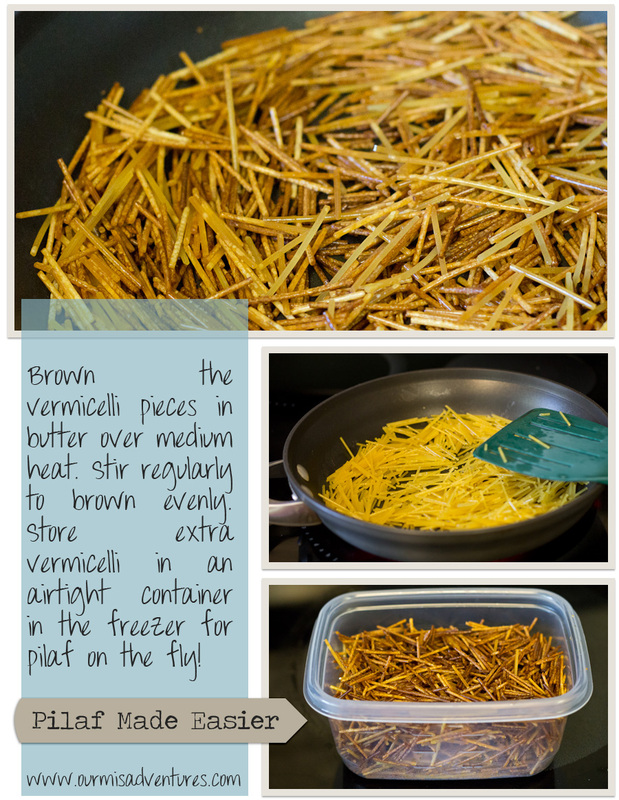 Store extra vermicelli in the freezer up to two months. In a saucepan, bring chicken broth and 1/2 to 1 stick of butter to a boil. Keep completely covered for 22 minutes. Remove from burner & fluff!